Asian markets are trading lower especially Nikkei lost more than 0.5% on strong yen. The yen was trading higher against all majors especially against USD after Fed clearly mentioned that there will not be any rate hike by 2019. US 10 year declined sharply which has supported Japanese yen. USDJPY has jumped nearly more than 50 pips from recent low of 110.29. US markets has closed higher after consolidation with Dow Jones at 25962.5 (0.84% higher) and S&P500 2854.88 (1.09% higher).Nikkei hits intraday low of 21443 and is currently trading around 21511. 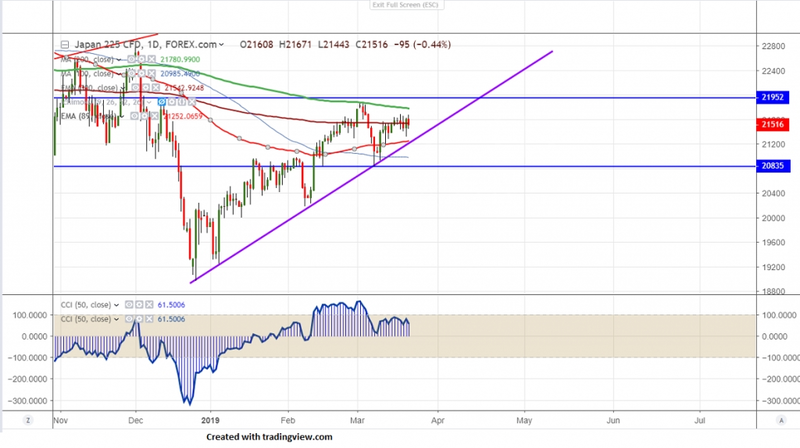 On the lower side, near term support is around 21400 and any break below targets 21250 (89- day EMA)/20991-21070 (100- day MA and trend line support)/20800. The near term resistance is at 21680 and any break above targets 21800 (200- day MA)/22000. It is good to buy on dips around 21300-325 with SL around 21180 for the TP of 21800.